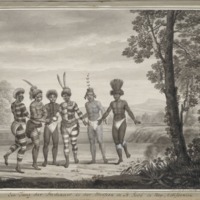 Six Ohlone indians, their bodies vividly painted and wearing headdresses of bright feathers, line up to dance. While this looks like a spontaneous event, the dancers were called upon to perform by the Franciscans who oversaw the mission at which they lived for the benefit of two German naturalists who visited in 1806. Across indigenous America, dancing was a ceremonial activity. That these men were being asked to perform within a mission shows either Franciscan tolerance or their active incorporation of native ritual into Catholic practice, which also happened in central Mexico some three centuries before. No sign of the Franciscan mission of San José is visible, even though this event took place there. The Ohlone, like other California natives, once lived in small communities that spanned ecological zones, allowing them to hunt and gather a wide variety of animals and foodstuffs. At the bottom of the image, above the word "Californien," appears a legend in French, "dessiné par G. von Langsdorff" (drawn by G[eorg Heinrich] von Langsdorff) but the work was created by his colleague, the naturalist Wilhelm Tilesius von Tilenau, who served as artist to the expedition. The creator of this image, Wilhelm Tilesius von Tilenau (1769-1857), was German born, but worked for much of his career in Russia, where he joined an expedition to circumnavigate the globe, during which he created this painting. At the end of his life, he was a professor of Natural History at Leipzig, and the broad title gives some hint of his intellectual pursuits. He spent time identifying and cataloging animal species as well as writing on human diseases. The work is on paper, drawn and painted with ink, wash, and gouache, and measures 22.4 x 28.2 cm. The illustration is evidence of Russian-Spanish interaction along the Pacific Coast. Its artist was part of an expedition sponsored by a Russian court official and businessman, Nikolai Rezánov. Rezánov attempted to create a network of food suppliers to provision Russian outposts in the Pacific. To this end, he traveled into northern California at the beginning of the 19th century and negotiated with Spaniards living in the San Francisco presidio. Accompanying him was his physician, Georg Heinrich von Langsdorff. Langsdorff made a point of visiting the missions run by the Franciscans along the coast and journeyed to the southern Bay Area to the small mission of San José, today in the heart of Silicon Valley. To welcome their foreign visitors, the Franciscans had their “neophytes”—the local Ohlone Indians who lived at the mission—perform a dance. 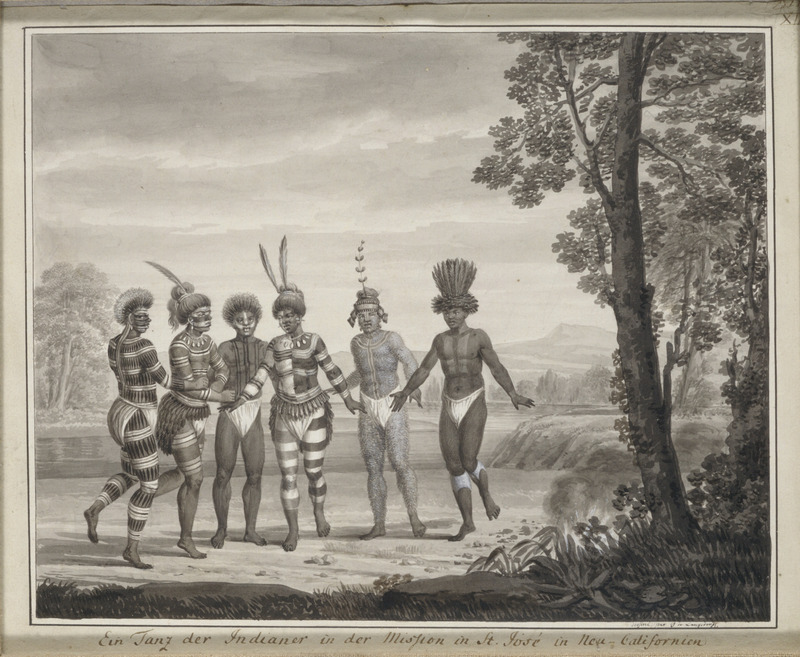 As seen by German travelers, the Ohlone Indians that are the subject of this image appear as foreign and exotic. Their feathers and body paint conform to tropes of exotic Amerindians that had circulated in Europe from the sixteenth century onwards. The figures appear as natural as the trees and plants around them. What is cropped from the frame is evidence of their colonial status. Living on a mission, their evangelization overseen by resident Franciscans, the Ohlone dancers were asked to turn ritual dance, once done for themselves and their community, into a spectacle for visitors. Damkaer, David M. 2002. The Copepodologist's Cabinet: A Biographical and Bibliographical History. Philadelphia: American Philosophical Society. Langsdorff, Freiherr von Georg Heinrich. 1927. Langsdorff's Narrative of the Rezanov Voyage to Nueva California in 1806. T. C. Russell, ed. San Francisco: Thomas C. Russell. Van Nostrand, Jeanne and Edith M. Coulter. 1948. California Pictorial: A History in Contemporary Pictures, 1786 to 1859. Berkeley and Los Angeles: University of California Press. Voss, Barbara L. 2008. The Archeology of Ethnogenesis: Race and Sexuality in Colonial San Francisco. Berkeley and Los Angeles: University of California Press.